We had an excellent stay at Kailua Kai. A spacious house with a great location and a beautifully landscaped yard. We plan to stay there again! My family and I spent the week of christmas at this home and had a great time. The yard walking out to the beach was great for our kids to run around and having direct beach access which was not crowded to beautiful sandy beach could not have been better. The home was very spacious as well. Would highly recommend this rental to anyone wishing to visit Hawaii with their family. Fantastic beachfront location; spacious house, great yard! Kailua Kai was perfect for our December family vacation. 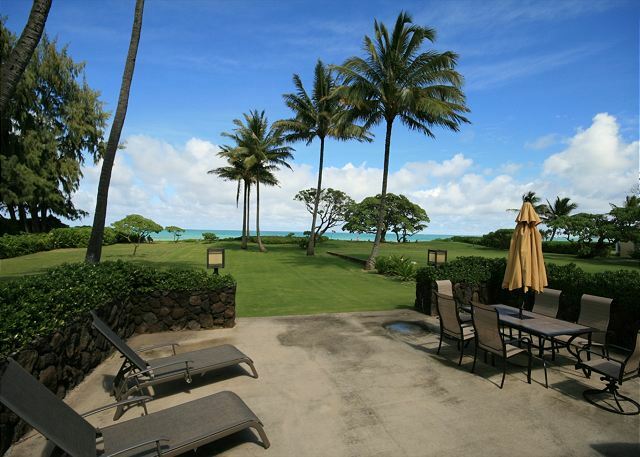 The private beachfront location along with close proximity to Kailua town was wonderful. Shopping and restaurants were all a short 5 minute drive. We also took great advantage of cooking and enjoying large family meals at home. Bedrooms are spacious, each with an en-suite. However, I can’t say enough bout the location - beautiful, beautiful, beautiful! I definitely recommend this property and would stay here again myself. This is a beautiful property on an amazing beach. It's tucked away at the back of a lane making it very private and quiet, but a short bike ride or drive to Kailua town with all of its good food. The property managers are very friendly, helpful and responsive. It was a great spot for our family of six to relax for 10 days. Being right on Kailua Beach is a dream! The house is a true beach house and the location is outstanding! The beach side lawn is huge and well cared for. Great for Kids! Overall, it was a good choice for our family size. Experienced some minor difficulties. Leaking ceiling in living room. Noisy lawn maintenance weekly. Maintence on irrigation system. We were a family of 7 adults and 1 very active 2 year old. The house was very comfortable with two seating areas inside and two patios outside. Well stocked in kitchen, beach chairs, boogie boards. Parking area had plenty of room for 4 cars. Grass areas front and back great for 2 year old play. Nice sandy beach for walking/sitting. Didn't see any surfing except for wind surfing and kite surfing. It is the windy side of Island and our first couple of days were very windy. Good location for grocery stores and restaurants. Close access to road to Honolulu. Property manager was great to work with and responsive. One warning - the upstairs bedroom is a loft. Not sure if property description mentioned that fact. But would still definitely go back there and recommend to others. This property is in a fantastic location. Great sandy beach that is not crowded. The home is great with full bathrooms/showers in every room. I was there with wife and 3 married children. This house easily accommodated us all. The home has some typical beach wear due to salt weather. The only thing that could have made the stay better would be air conditioning, however there is a gentle trade wind and keeping the house open made it feel like you were bringing the outside in. Listening to the waves from the bed at night was incrdible. I would definitely recommend staying here if you have a group. Highly recommend Kailua Kai. It was perfect for my family of 6 adults visiting from the Mainland. 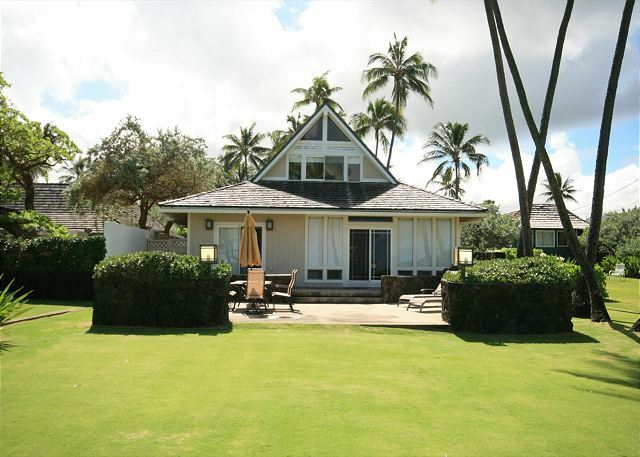 It is well situated on beautiful Kalama Beach and offers ample privacy from the public beach. This rental offers ample parking, beautiful landscape, large backyard, beach supplies, gas grill, outdoor shower and more. In addition to a back lanai (which is perfect for watching sunrises), there is a covered front lanai perfect for enjoying cocktails and cooling off after a great day on the beach. Kailua Town is close and offers many great local businesses as well as Whole Foods, Safeway, and Longs (to name a few). Aloha Beachfront Rentals were responsive and accommodating. We will definitely be back! Overall, we had a grand vacation with family. The location was terrific and the house suited our needs just fine. It would have been nice if the dishwasher worked. Also the sink in the downstairs master bath was plugged. Hopefully these things will be taken care of by maintenance prior to the next rental. These were excellent guest and we regret they did not notify of on the plugged sink or dishwasher not working as we would have attended to it right away. All issues have been addressed. I grew up in Kailua, and to return home for a vacation with family, and to find a special place, we did!! 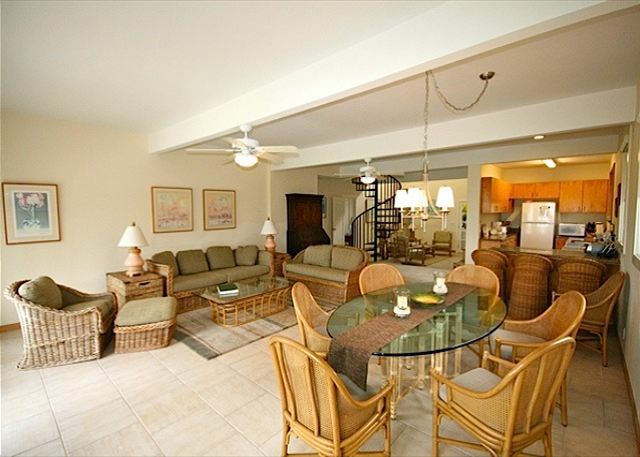 Kailua Kai is perfectly located, with beautiful ocean/beach views, and the ever present cooling breezes. The backyard is spectacular and offered our 2 grandsons a great place to play( although they loved the beach more). Our house was very comfortable for our group, and the ensuite bathrooms for each room plus a half bath was great! The property needs a few maintenance repairs but nothing that takes away from a great place. Kawika, the property manager, was exceptional on our visit, and was always available to answer questions and assist. We will return here on our next visit. We had a great experience at this property. The location was ideal and the beach is literally out the back door. One of the nicest things was each room had a bathroom, so there was ample space for everyone's needs when it was time to get cleaned up after a day at the beach. There was even an outdoor shower! Grocery stores, Island snow (shaved ice) and the market where a mile away. The property manager was great to work with. FYI: The owner of the property lives next door. We loved our stay here. How nice to walk out to the beach. The view is better in person. Check in was a little bumpy, the directions mentioned a key under the mat, but there was a code for the door, which is great, except we didn't know what it was. The house was spotless, which is always the most important thing. We cooked in a couple of nights and had what we needed to do that. We used the nicer Tommy Bahama beach chairs, but the others were too rusted. The house feels big and was perfect space for the 7 of us. When the tradewinds aren't blowing, it gets a little warm in the house, but we were fine. We were all very happy and would definitely rent the house again if we have a big enough group and go to Kailua again. Loved the area and very accessible to other parts of the island! Thank you! The location of Kailua Kai couldn't be better! We loved every minute of our week in this lovely home. The space is very versatile, clean and easy to use. We had a wonderful time. It was perfect - so hard to leave! We were all in heaven with the views and the easy access to our favorite beach. Every day we walked or jogged the beach. Swimming was fun for all ages and especially the boogie boarding. The house was comfortable, spacious, and well-stocked with supplies. The kitchen was easy to cook in with everything you need. The front covered veranda was a wonderful place to sit and relax. Don't get your heart set on the hammock. The trees that held it have been cut down and there isn't one anymore. 2 of the bathroom doors were stuck and maintenance was unable to resolve during our stay. Otherwise house was well maintained and had fresh paint. The pictures don't do the place justice. It's much better in real life. You can hear the ocean from every room. Beds are comfortable. Beautiful home with the most awesome view, yard and beach. We had 3 couples and a baby and this place fitted us all quite well. There were boogie boards, sand toys and chairs, towels, BBQ, patio furniture for our use. All the rooms had fans and it was quite comfortable for sleeping. Stores and restaurants are very close. Just down the beach is a place to rent kayaks, paddle boards and snorkel equipment. We did not want to leave. Kapola was awesome to work with. She even took a group photo for us having dinner on the front Lanai. Would highly recommend this home for vacation rental. 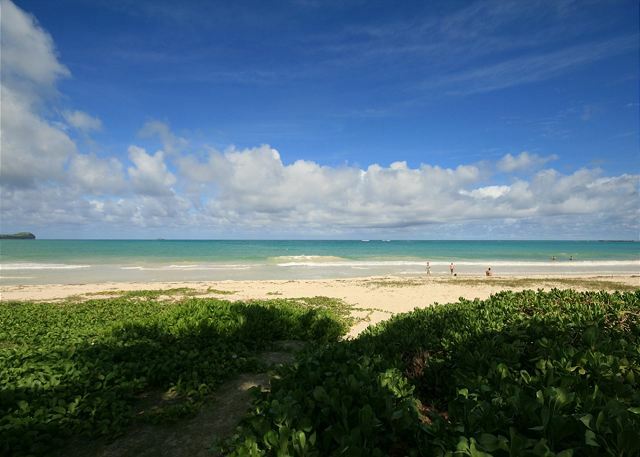 Very clean , and comfortable room ,and for a location best posision of Kailua Beach front. Parking lot is good enough space for us. 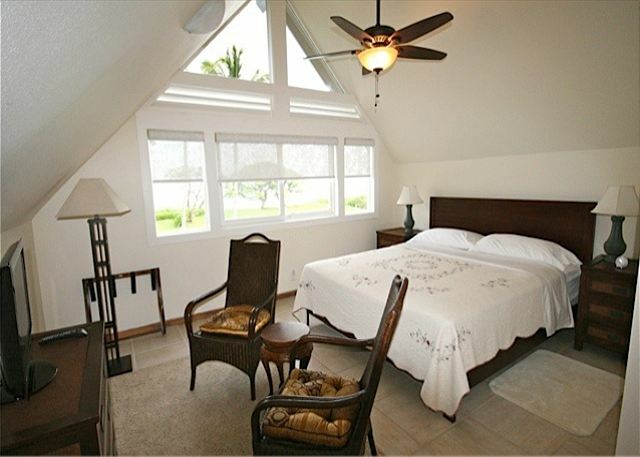 If this Kailua Kai has two twin bed room , This is more better stay for all men group. 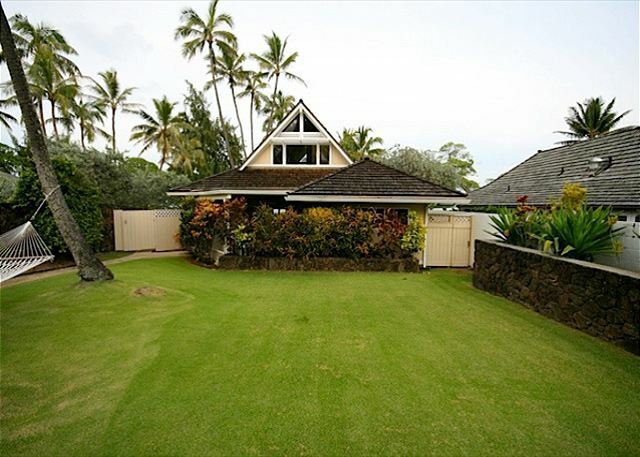 My family and I recently rented Kailua Kai, spacious 4 bedroom home right on the Beach in Kailua. We were greeted upon arrival by Kepola, she was very friendly, knowledgeable about the house and surrounding areas. My family thoroughly enjoyed their stay and would definitely rebook this home for our future trips to Hawaii. The team effort to make our family's gathering enjoyable is greatly appreciated! Great location, nice big yard. Hawaiin dream vacation come true! Great house, beautiful views, excellent location ... Best vacation ever!!! The house was great. Check in and out were handled well and they were very flexible. Very short walk to the beach. Close to grocery store etc. We had a great time and wouldn't hesitate to go back. Worked well for 4 couples. Boogie boards etc. were provided as well. Only complaint was they need a bigger grill. The layout and ambience of the beach house was perfect for a family gathering. Casual but every need was met. From outside hot shower, beach toys and chairs, to all the kitchen amneties. Plenty of room for gatherings and for alone time. Kailua Beach is one of the most beautiful in the world. The rental contact was the best and extremely helpful. I will be back for sure. The beach front house is awesome. Very clean. We also love the huge yard, lots of fun. Great location as well not far from the town. We enjoyed the night market a lot. Highly recommended. Kailua Kai is right on Kailua Beach. One of the nicest beaches you'll ever find. 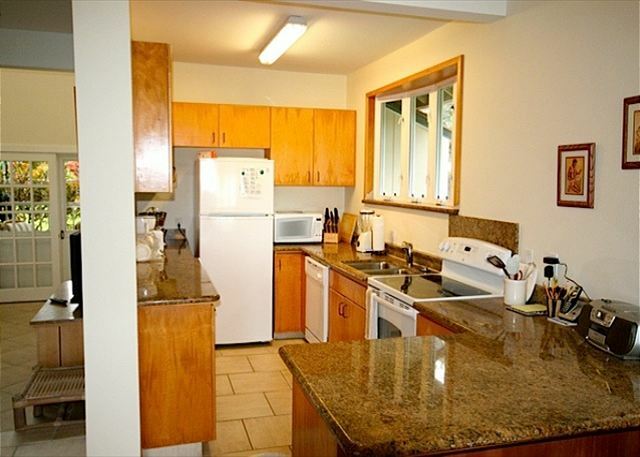 Close to Kailua Town and convenient to anywhere on Oahu. A fabulous spot to spend some time in beautiful Hawaii. Our family absolutely loved the home and the easy access to the beach - it was like having our own beach. 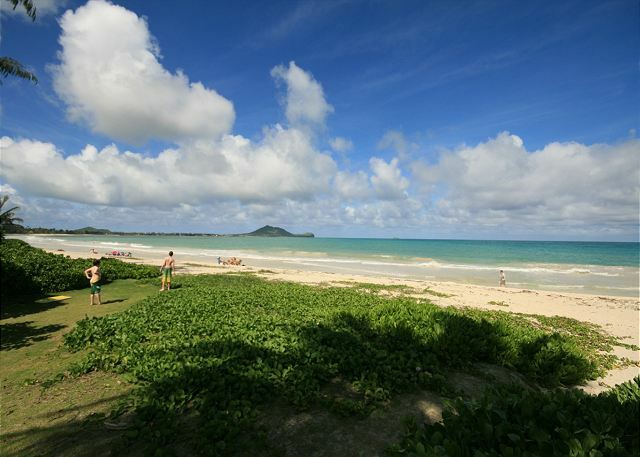 Kailua is one of the best places in the islands to vacation and spend a week. I would highly recommend this property to anyone. My family trip was complete. Professional all the way and Kepola was so chill and awesome. We felt at home and the home was very accomodating and relaxing. I can't stay at a hotel again since this experience was above and beyond. Thanks! We loved our stay at Kailua Kai! It has a huge yard that leads right to the ocean--marvelous! Great place--so comfy!